These are chocolate with raspberry buttercream cuppies that I made for my very good friends Jason and Keren’s wedding last weekend. They have a little problem with loving wrestling. Well, they don’t think it’s a problem, but I know better. I found all these beaten up wrestling figures for really cheap and placed them around the cake, which served two purposes; to keep an eye and make sure no one took cupcakes before it was time and also to be flower girls. On top is The Invisible Girl and the stretchy guy. I know the stretchy guy is not Plastic Man because I got chastised for saying it was. I won’t make the same mistake twice. Mazel tov Jason and Keren! Whatcha gonna’ do when the elbow runs wild on you? We cupcatered an office party in midtown Manhattan today. Highlights included a freight elevator and a real live water cooler. Thanks to Rebecca Bent, our lovely photographer in VCTOW, for these pretty shots. “Monday was my niece’s 5th birthday, so we had her party Sunday afternoon. The recipe is from kittee at pakupaku. I am especially impressed with the improv-ed cupcake tower, it was actually her mom’s spice rack. Cupcakes are the mother of invention. What does it mean when non-vegans enjoy eating vegan food? Even omnivores like it. It’s a compliment of the highest order. Every vegan cookbook promises it. I am happy when vegans are enjoying their food; that’s why we started the cooking show, to keep vegans well-fed and entertained, not to convert anyone. And yet, try as I might to deny it, I’m reluctantly waiting for that omnivore seal of approval. Of course he was expecting something, it was written all over his face. He was expecting it to “taste vegetarian,” which, to his sensiblities, was a bad thing. Did he recognize the the notes of roasted onion, the leek and mushroom that I used to make the broth? Was he able to savor the tomatoes that I had gotten from the farmers’ market that very morning, blanched and peeled myself, all simmered and garlicky? How about the chickpeas I had soaked and boiled, the way they burst open on your tongue? No. He wanted the veal stock box. He needed to taste the box. Spoon to lips was only a handful of seconds, but the tension was probably that of a boxer’s before a big fight, only completely unfair because I wouldn’t even get a chance to throw a real punch. The fight was fixed. It was going to taste like a handful of grass to him. And so I learned a valuable lesson. Never tell them it’s vegan. Not until after the compliments have come in. At this point in my life it’s mostly hard to avoid because I’ve written a cookbook. After 16 years of eating the food I make, my friends and family know that it’s going to be good. They know that my cookies are going to disappear; it isn’t even a big deal, they’re just cookies now. 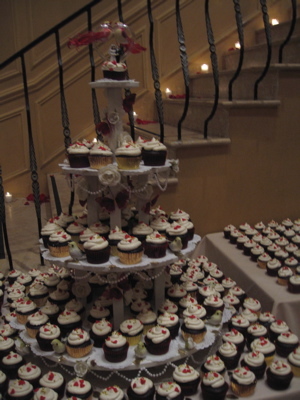 And so it was interesting to bake the cupcake tower for my friend’s wedding last weekend. Most of the guests didn’t know the cupcakes were vegan. It was thrilling to watch them, smudged brushstrokes of frosting not yet wiped from their chins, and see their expressions as they took one bite, then another, some going back for seconds with a little cake still left in the wrapper of the first. Little girls in frilly dresses twirled on the dancefloor, cupcakes in hand. It made me think of the cognitive dissonance that humans face everyday as they buy their cold, dewy cartons of milk, the happy cow painted on the front. It’s so hard to give up what we’re used to. We’re so convinced that we can’t let go, that this is the way it always has been and this is the way it always will be, that our little glass of milk doesn’t make a difference, and even if it does, who cares? Why should we even care? Plus, there is no way we can live without meringue. But who even really likes meringue? And so I suppose the bottom line is that’s why it’s more important when a non-vegan likes our food. Because we feel we’ve changed something, set a mind on a different course. Of course, it doesn’t mean that the taster will never eat dairy again. They might not even remember the experience in the minutiae of their everyday life. But the next time they’re presented with a vegan cookie or a soup, their mentality will be different. The fight won’t be there; enjoying it will come easier. And that is the paradigm shift, the one little grain of sand, one of those “little things” we hear about, the ones that they say count. I’m sure that the first simple cell that ever existed seemed insignificant, not that anyone was around to notice, but now look at us, a bunch of simple cells running around doing who knows what. I know, enough with the talky talky, make with the cupcake tower. Click “more” for the rest of the pho-tos.